For centuries, the only visual standard of narrative storytelling was the theatre. Since the first narrative films in the 1890s, film-makers sought to capture the power of live theatre on the cinema screen. Most of these film-makers started as directors on the late 19th century stage, and likewise most film actors had roots in vaudeville or theatrical melodramas. Visually, early narrative films had adapted little from the stage, and their narratives had adapted very little from vaudeville and melodrama. Before the visual style which would become known as "classical continuity", scenes were filmed in full shot and used carefully choreographed staging to portray plot and character relationships. Cutting was extremely limited, and mostly consisted of close-ups of writing on objects for their legibility. Though lacking the reality inherent to the stage, film (unlike stage) offers the freedom to manipulate apparent time and space, and thus to create the illusion of realism — that is temporal linearity and spatial continuity. By the early 1910s, film-making was beginning to fulfill its artistic potential. In Sweden and Denmark, this period would be known as a "Golden Age" of film; in America, this artistic change is attributed to film-makers like David W. Griffith finally breaking the grip of the Edison Trust to make films independent of the manufacturing monopoly. Films worldwide began to noticeably adopt visual and narrative elements which would be found in classical Hollywood cinema. 1913 was a particularly fruitful year for the medium, as pioneering directors from several countries produced masterpieces such as The Mothering Heart (D. W. Griffith), Ingeborg Holm (Victor Sjöström), and L'enfant de Paris (Léonce Perret) that set new standards for film as a form of storytelling. It was also the year when Yevgeni Bauer (the first true film artist, according to Georges Sadoul) started his short, but prolific, career. In the world, generally and America specifically, the influence of Griffith on film-making was unmatched. Equally influential were his actors in adapting their performances to the new medium. Lillian Gish, the star of The Mothering Heart, is particularly noted for her influence on screen performance techniques. Griffith's 1915 epic The Birth of a Nation was ground-breaking for film as a means of storytelling — a masterpiece of literary narrative with numerous innovative visual techniques. The film initiated so many advances in American cinema that it was rendered obsolete within a few years. Though 1913 was a global landmark for film-making, 1917 was primarily an American one. The era of "classical Hollywood cinema" is distinguished by a narrative and visual style which would begin to dominate the medium in America by 1917. The narrative and visual style of classical Hollywood style would further develop after the transition to sound-film production. The primary changes in American film-making came from the film industry itself, with the height of the studio system. This mode of production, with its reigning star system bankrolled by several key studios, had preceded sound by several years. By mid-1920, most of the prominent American directors and actors, who had worked independently since the early 10s, would have to become a part of the new studio system to continue to work. The beginning of the sound era itself is ambiguously defined. To some, it began with The Jazz Singer, which was released in 1927 and increased box-office profits for films, as sound was introduced to feature films. To others, the era began in 1929, when the silent age had definitively ended. 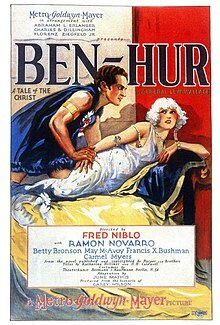 Most Hollywood pictures from the late 1920s to 1960s adhered closely to a genre—Western, slapstick comedy, musical, animated cartoon, and biopic (biographical picture)—and the same creative teams often worked on films made by the same studio. For instance, Cedric Gibbons and Herbert Stothart always worked on MGM films; Alfred Newman worked at Twentieth Century Fox for twenty years; Cecil B. DeMille's films were almost all made at Paramount Pictures; and director Henry King's films were mostly made for Twentieth Century Fox. Similarly, actors were mostly contract players. Film historians and critics note that it took about a decade for films to adapt to sound and return to the level of artistic quality of the silents, which it did in the late 1930s. Many great works of cinema that emerged from this period were of highly regimented film-making. One reason this was possible is that, with so many films being made, not every one had to be a big hit. A studio could gamble on a medium-budget feature with a good script and relatively unknown actors: Citizen Kane, directed by Orson Welles and regarded by some as the greatest film of all time, fits that description. In other cases, strong-willed directors like Howard Hawks, Alfred Hitchcock, and Frank Capra battled the studios in order to achieve their artistic visions. The apogee of the studio system may have been the year 1939, which saw the release of such classics as The Wizard of Oz, Gone with the Wind, The Hunchback of Notre Dame, Stagecoach, Mr. Smith Goes to Washington, Destry Rides Again, Young Mr. Lincoln, Wuthering Heights, Only Angels Have Wings, Ninotchka, Beau Geste, Babes in Arms, Gunga Din, Goodbye, Mr. Chips, and The Roaring Twenties. The visual-narrative style of classical Hollywood cinema as elaborated by David Bordwell, was heavily influenced by the ideas of the Renaissance and its resurgence of mankind as the focal point. It is distinguished at three general levels: devices, systems, and the relations of systems. The devices most inherent to classical Hollywood cinema are those of continuity editing. This includes the 180-degree rule, one of the major visual-spatial elements of continuity editing. The 180-degree rule keeps with the "photographed play" style by creating an imaginary 180-degree axis between the viewer and the shot, allowing viewers to clearly orient themselves within the position and direction of action in a scene. According to the 30-degree rule, cuts in the angle that the scene is viewed from must be significant enough for the viewer to understand the purpose of a change in perspective. Cuts that do not adhere to the 30-degree rule, known as jump cuts, are disruptive to the illusion of temporal continuity between shots. The 180-degree and 30-degree rules are elementary guidelines in film-making that preceded the official start of the classical era by over a decade, as seen in the pioneering 1902 French film A Trip to the Moon. Cutting techniques in classical continuity editing serve to help establish or maintain continuity, as in the cross cut, which establishes the concurrence of action in different locations. Jump cuts are allowed in the form of the axial cut, which does not change the angle of shooting at all, but has the clear purpose of showing a perspective closer or farther from the subject, and therefore does not interfere with temporal continuity. Classical narration progresses always through psychological motivation, i. e., by the will of a human character and its struggle with obstacles towards a defined goal. This narrative element is commonly composed of a primary narrative (eg. a romance) intertwined with a secondary narrative or narratives. This narrative is structured with an unmistakable beginning, middle and end, and generally there is a distinct resolution. Utilizing actors, events, causal effects, main points, and secondary points are basic characteristics of this type of narrative. The characters in Classical Hollywood Cinema have clearly definable traits, are active, and very goal oriented. They are causal agents motivated by psychological rather than social concerns. The narrative is a chain of cause and effect with the characters being the causal agents — in classical style, events do not occur randomly. Time in classical Hollywood is continuous, linear, and uniform, since non-linearity calls attention to the illusory workings of the medium. The only permissible manipulation of time in this format is the flashback. It is mostly used to introuce a memory sequence of a character, e. g., Casablanca. The greatest rule of classical continuity regarding space is object permanence: the viewer must believe that the scene exists outside the shot of the cinematic frame to maintain the picture's realism. The treatment of space in classical Hollywood strives to overcome or conceal the two-dimensionality of film ("invisible style") and is strongly centered upon the human body. The majority of shots in a classical film focus on gestures or facial expressions (medium-long and medium shots). André Bazin once compared classical film to a photographed play in that the events seem to exist objectively and that cameras only give us the best view of the whole play. This treatment of space consists of four main aspects: centering, balancing, frontality, and depth. Persons or objects of significance are mostly in the center part of the picture frame and never out of focus. Balancing refers to the visual composition, i. e., characters are evenly distributed throughout the frame. The action is subtly addressed towards the spectator (frontality) and set, lighting (mostly three-point lighting, especially high-key lighting), and costumes are designed to separate foreground from the background (depth). The aspects of space and time are subordinated to the narrative element. Many of the film-makers listed below did multiple chores on various film productions through their careers. They are here listed by the category they are most readily recognized as. If they are recognized in more than one category on the same level, they are listed in all of them. The following is a list of directors associated with classical Hollywood. Some of them also had careers in other countries (e. g., Hitchcock and Renoir), and some also had careers either before (e. g., Griffith) or after (e. g., Huston) the classical era. ^ a b Goldburg, Michael. "Classical Hollywood Cinema (Internet Archive)". Archived from the original on 31 May 2007. Retrieved 31 May 2007. ^ "The "golden age" of silent film – Sweden – bio, actress, children, wife, cinema, role, story". ^ Brownlow, Kevin (1968). The Parade's Gone By..., University of California Press, p. 78. ISBN 0-520-03068-0. Bordwell, David; Staiger, Janet; Thompson, Kristin (1985). The Classical Hollywood Cinema. New York: Columbia University Press. ISBN 0-231-06055-6. Davis, Blair (2012). The Battle for the Bs: 1950s Hollywood and the Rebirth of Low-Budget Cinema. New Jersey: Rutgers University Press. ISBN 978-0813552538. Fawell, John. (2008) The Hidden Art of Hollywood. Westport Conn.: Praeger Press. McGilligan, Patrick (1985). Backstory 1: Interviews with Screenwriters of Hollywood's Golden Age (No. 1). University of California Press. ISBN 978-0520056893. Salt, Barry. Film Style and Technology: History and Analysis. Dixon, Wheeler Winston (2013). Cinema at the Margins. Anthem Press. ISBN 978-0-85728-186-9. David Bordwell and Kristin Thompson, "Happy Birthday, classical cinema! ", December 28, 2007. Analysis of classical continuity in narrative film from 1917 to this day.